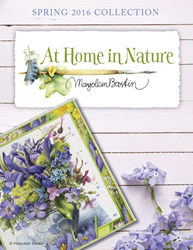 Art Brand Studios unveils new art - "Marjolein Bastin: At Home in Nature - Spring 2016 Collection"
We are excited to partner with Marjolein Bastin. Her watercolors are intimate, up close encounters with the flora and fauna found on the back patios, garden, and neighborhoods in which we all live. Art Brand Studios (ABS) announces its first release from painter Marjolein Bastin. A well-established artist in both the United States and Europe, Bastin’s vibrant nature and garden-style art have been featured for many years in Hallmark’s greeting card and gift product lines. To date, Bastin’s Limited Edition Art could only be found on the secondary market, leaving fans and followers no opportunity to acquire new high quality, Limited Edition work from the artist. Art Brand Studios will now fill this gap and bring Bastin’s art to the United States by "Marjolein Bastin: At Home in Nature - Spring 2016 Collection" releasing Limited Edition prints for the first time in 15 years. The initial product suite including, is now available in Art Brand Studios Galleries. “We are excited to partner with Marjolein Bastin. Her watercolors are intimate, up close encounters with the flora and fauna found on the back patios, garden, and neighborhoods in which we all live. She captures the hues, tones, and ambiance of those subjects for each season,” explains Scott Usher, Art Brand Studios Vice President of Publishing. Initially launched with seasonal releases of Limited Edition Art and Open Edition Gallery Wrapped Canvases, the line will soon expand to include additional home décor and gift products. Bastin’s watercolor paintings are an intimate window into the hidden beauty of nature and will tap into the flourishing Home and Garden lifestyle trend. Marjolein Bastin’s art will be distributed through Art Brand Studios Galleries and gift stores throughout the United States and Canada. Art Brand Studios publishes the work of Thomas Kinkade, Thomas Kinkade Studios, Marjolein Bastin, and Zac Kinkade, with distribution of the art and related collectibles through independently owned galleries worldwide, an extensive network of branded and licensed dealers, and strategic marketing relationships with more than 70 licensees. The company’s primary products are canvas and paper reproductions that feature inspiring themes.